Join us in congratulating Adriana Galván! 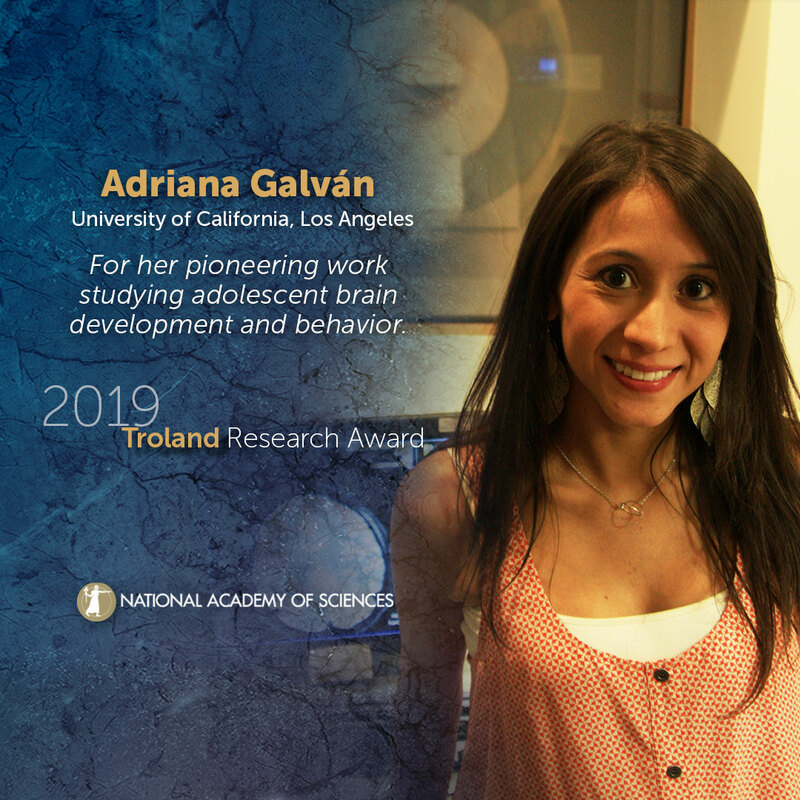 Adriana Galván, University of California, Los Angeles, will receive a 2019 Troland Research Award. Galván has made pioneering discoveries about brain development in children, adolescents, and adults. Her work, conducted with an eye toward informing policy on juvenile justice and related issues, has already transformed our understanding of adolescent neurobiological development. In particular, one of Galván’s first studies, published in 2006, changed our perception of adolescent risk behaviors. At the time, it was assumed these behaviors were related to the development of the prefrontal cortex. Galván challenged this, demonstrating that it is actually much more nuanced. This influential paper has already been cited more than 1,100 times and laid the groundwork for understanding other characteristic adolescent behaviors. Also in 2006, Galván tackled the question of why adolescents are more at risk of accidental death. She showed that the adolescent brain inadequately regulates feelings such as desire, fight and flight. The research showed that adolescence is not just a transition into adulthood; it is also a transition out of childhood. Galván’s work has also addressed critical environmental factors affecting behavior, such as the role of sleep and family disadvantages on the neurodevelopment of the parts of the brain associated with risk and reward. Perhaps most importantly, Galván’s recent research has also shown that the adolescent brain is also adaptive, illustrating ways that behavior can be improved and that the adolescent brain is excellent at learning new information and learning from feedback. Collectively, Galván’s groundbreaking work has challenged and changed our perception of adolescent development and has, in just over a dozen years, had tremendous impact on science, law and social policy. Two Troland Research Awards of $75,000 are given annually to recognize unusual achievement by young investigators (defined as no older than 40) and to further empirical research within the broad spectrum of experimental psychology. Please use the following sample social media posts and other materials to congratulate Adriana Galván.